I am enjoying an online writing class with Tammy Strobel of RowdyKittens where I am reminded of how much courage it takes to click publish and share with the world. Thank you, Tammy and classmates! 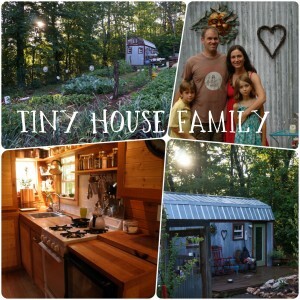 It’s been a year since I first clicked publish on TinyHouseFamily, and what a ride it has been. I remember posting about how I’d like to get someone to come over and take a video for me, so the camera wouldn’t be so shaky. I never thought it would be two cool guys straight off a plane from the Anderson show. Or that we’d fly to New York and share our tiny house on national television. All of this publicity has been exciting and fun, but when I read my first blog post I remember why I started this blog: I wanted to share how simplicity has brought me a deep level of connection and peace. As I walked through the garden this morning, I thought about our blog, and how much I think about what to write. I’ve wrestled with where to start. Do I go back to when we had a 1500 sq. ft. house and a stress-filled life? How do I start without telling the whole story? Being present with my vegetables brought the answer: Start Where You Are – a title of one of the few books on my bookshelf. Sure, our story has a past and a future, but as I strive to live mindfully in the present, it makes sense that I should start where I am, standing next to this huge pile of rocks looking at the basil, which is about to go to seed. I decide to make pesto. I walk through the garden gate, creatively crafted by my honey with salvaged materials and a few leftovers from tiny house construction. That quote I put on our homepage pops into my head, “We are happy in proportion to the things we can do without.” I wonder what feelings Thoreau had when he wrote that, I wonder what he was doing when those words came to him. I like the sound of them. As I spend time in each step of pesto making, I ponder what this quote means to me. Doing without creates a vacuum, a space for creativity, and being creative brings happiness. Now that the basil is harvested and clean, I need to dry the leaves, but we decided to get rid of the salad spinner. I’ve seen them at yard sales and could easily replace it–certainly would make drying greens easier. But, if I had a salad spinner, I never would have learned to BE the salad spinner. How happy I feel when I wrap the basil in a towel, twist the ends like a candy wrapper, step outside and wind it up like my middle school buddy, Amy, did when she threw a fast pitch. I watch the water spin out, splatter the deck and feel it sprinkle my face. I smile unwrapping totally dry basil. I am happy without a salad spinner AND it doesn’t take up space in my home. Being the salad spinner, I am totally present and enjoying my life. Making do makes me happy. In the process of being creative making do, I slow down, and settle into mindful being. Slowing down brings joy. Now that the basil is dry, I need to chop it. The recipe calls for a food processor. Looking at my harvest is a bit daunting. Now, I become the food processor. I settle into a rhythm: CHOP-CHOP-CHOP, SCRAPE-IT-TOGETHER, CHOP-CHOP-CHOP, SCRAPE-IT-TOGETHER. . . My mind goes to Thich Nhat Hanh’s essay, “Interbeing” in Peace Is Every Step: The Path of Mindfulness in Everyday Life . Looking into the basil, I see the sun shining in the bathroom window warming the seedlings in March, as I anticipate moving into the tiny house and growing a garden. I hear the wind blowing through the kids’ loft knocking the fan out of the window, as it brings mid-May downpours on new basil transplants. I see the factory in China making the scissors I use to cut the basil. I taste the olive oil in Italy after the first cold press. I smell my mother as she holds my newborn self and see my hand holding hers, this hand that goes CHOP-CHOP-CHOP, SCRAPE-IT-TOGETHER, CHOP-CHOP-CHOP, SCRAPE-IT-TOGETHER. . . “We cannot just ‘be’ by ourselves alone. We have to inter-be with every other thing. This [pesto] is, because everything else is.” Doing without a food processor slows me down, and I settle into the rhythm of all of life. I see and feel my connection to everything. It comforts and satisfies me when I connect in this way. I add the olive oil, garlic, cheese and salt, mix it up, clean up my mess and stick my finger in for a taste. Somehow, I don’t think I’m missing out on anything. Thoreau was right. Today, I made pesto with my hands and tasted the universe. What more could I want? I’m glad you posted this blog and I’m glad things are going well for you guys. I like the Thoreau quote as well. He was a wise fella I think. I was wondering, did you ever read anything by Eckhart Tolle? It just seems like something you might enjoy. Take care guys. I’m looking forward to reading more. Thank you, Mr. Miller. You make me laugh, still. I enjoy reading your status updates. Love my Tiny House Family and my Tiny House Mama. Such peace. Gotta get me some. The peace is already there! To say that I love this pesto piece is not enough. It is more that I feel love when I read it. Love, and care, and peace. The infinite possiblities held within each moment appear, stretching and folding and carrying time, and us with it. You rock Girlfriend. Well done Mama. I love that, Lorien, “Infinite possibilities held within each moment appear, stretching and folding and carrying time, and us with it.” If reading my post made those words come to you, then I feel very happy, indeed. You are the daughter of a dreamer, a warrior of the Woodstock Nation, born on a full moon in the month ruled by the Moon, married on a full moon, and probably finishing getting this blog up and running during the recent full moon. You are a Magnificent Reflection of Our Nation that you are now building the foundation of! A Magnificent Reflection of a daughter, wife, mother, and Teacher! You are the Full Moon Lady! and I Love You! Now, the questions are, do we really want to commit to having this thing, caring for it, giving it a spot in our space BEFORE we bring it into our lives. Mindful consumption=less stress. Thank you for bringing my day into focus. I look forward to future respites at the tinyhousefamily site! I see you in a bathing suit near your cute red barn with a big smile. You are a bright spot, Joy! Thank you for reading my post. I love you. These are beautiful pesto-flavored words you have written:) I am so happy and excited you have decided to start a blog about the new life you are all enjoying. I love that the simplicity breeds creativity and therefore pushes you to become more in tune with every aspect of your life. How can that not be a wonderful thing?!? I hope to keep up with all your posts so that i may be inspired by this beautiful way of life. I am so thankful for having met you and gaining you as a friend. The ideas and inspirations that you and papa create are what made it possible for me to have this new, perfect family that label me wife and mother. I am so grateful. Keep up the beautiful work, I love you! Thank you, sweet Amanda. You have inspired me by your ability to be completely present with people. I love you too! LOVE your blog. Im so happy I found you – just today. I’m a mom of 4 and live in a 95 sq meters (around 1000 ft) apartment with huge garden, in a beautiful city (not USA). Our house is smallish, but it works for us and we love it. It always annoyed me to see people post on Tiny Homes when they were living there by themselves or one adult partner – I really dont think that that is so hard or special. 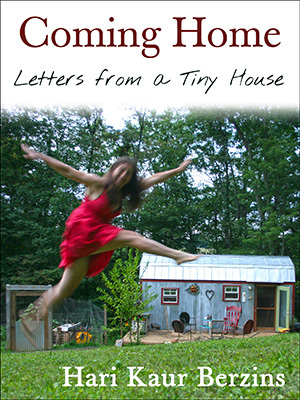 So I was always looking for FAMILIES living in Tiny Homes, and here you are! You show all the amazing benefits we have also discovered. Good on you, and good luck with building your new home !! I admire your courage and your strength. You represent why our country is so great, The land of the free and the home fo the brave. Thank you so much the inspiration and hope that you have given me through your blog. This post epitomises our need to do away with unnecessary – and sometimes dangerous – conveniences. Are you worse of having prepared the pesto the old fashion, labour-intensive way? To the contrary. I bet it tastes better. It was the best pesto I’ve ever tasted. I loved writing about it: the slowing down, the connection to everything. Thanks for reading and commenting! Best to you!